Lest the younger literary minds in the Beach feel left out, Ann Marie Meyers' new novel for young adults, Up In The Air, offers a great fantasy escape to another world, while also keeping its feet on the ground with messages of facing the past, trust, guilt, forgiveness and responsibility. The novel is Meyers' debut, though one wouldn't realize it to read it – Meyers writes with a refreshing confidence. Though she has a daughter, Up In The Air is not based on any real-life events, at least any that happened to her family. “How many of you—children or adults—have ever dreamed of flying?” This was writer Ann Marie Meyers’ question to the audience at the launch of her children’s book Up in the Air at Paper-Based Bookshop last weekend. The novel, targeted at nine-to-12-year-olds, is in the fantasy/adventure genre that children of this age love so much. It tells the story of Melody, who has always dreamt of flying. One day, she launches herself off a park swing with the intention of making it as far as the sandbox. Instead, she finds herself landing in an entirely different realm, the magical land of Chimeroan, where even the wildest dreams come true. I initially wanted to read this book at night with my two daughters. We started and my almost 4-year old got to a point where she wanted to just hear when Melody was flying. I knew then I just had to read it by myself and then tell them the stories afterwards. Ann Marie Meyers is brilliant! Her story brought me back to my own days in grade school. Like Melody I also loved to swing and I would go as high as I could and jump off–pretending I was flying. What kid didn’t pretend they could fly at some point during their childhood?! 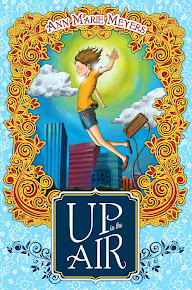 It’s been a little while since I finished reading a story called “Up In the Air” by Ann Marie Meyers. It took me quite a while to write my thoughts on this particular book because even I couldn’t quite put into words all that I had felt after reading it. I admit that about the time that I had finished chapter 3, I was not very interested. I find that I am a little too practical to enjoy fantasy ideas, and this story is all about being able to live a dream — no matter how fantastical it is. I thought that a story with witches, dwarfs, and fairies was much too foolish for someone as pragmatic as myself. But, I’m not one to leave something unfinished, so I continued reading the story, where I found a beautiful depth to the characters and an underlying meaning that even I could relate to. 10-year-old Melody wants to fly, to soar like an eagle far above the troubles in her earth-bound life. She knows if she can just swing high enough her wings will unfurl and she’ll finally be happy. Until then there’s always her patented zombie face guaranteed to frighten away the most tenacious bully or possible friend, keeping Melody safe in her self-imposed cocoon of isolation. When Melody leaps off a swing and into the mystical realm of Chimeroan where dreams come true, she begins a journey to not only earn her wings, but to face her past, conquer her fears, and to discover that the things that hold us back—even the things we want most desperately or fear with all our heart—are not always what they seem.